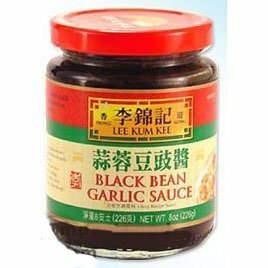 What can I say, I just love the Lee Kum Kee Brand Black Bean Garlic Sauce. And I have been using it for years now. 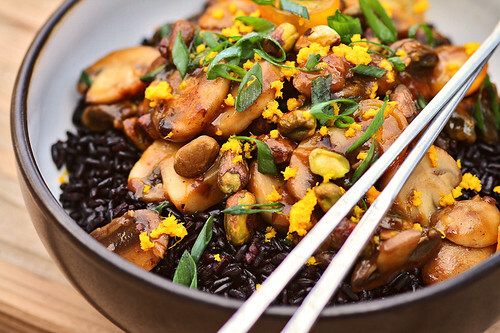 It gives stir-fry’s more depth in flavor than mere soy sauce can. In fact, I don’t even use soy sauce in my stir-fry’s. 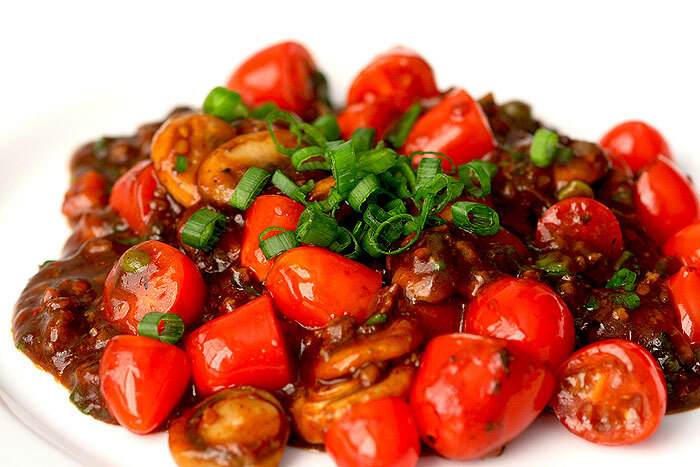 I just mix the black bean garlic sauce with oyster sauce and some kind of chili sauce (i.e pepper satay) and wham… like I’m in Chinatown, all of a sudden! In this dish, I used my leftover tomatoes and a little ground bison meat. Pretty simple and quick but bursting with flavor. By the way, I like my stir-fry sauce a little thick, like gravy. So, I simply mix in a slurry of cornstarch and stock. It’s awesome! Give it a try. Leftover Meat, ground, diced, sliced, etc. In a bowl, mix well all 3 sauces with stock and cornstarch. Meanwhile, in a medium heated skillet, add oil, meat and onions and cook for a few minutes. Add the sauce mixture and stir until bubbling. If sauce is too thick, simply add more stock. Turn off heat and stir in some chopped scallions. Serve on a plate and garnish with more scallions. I’ve never pan-fried egg noodles before and was always in awe whenever I have it at a “real” Chinese dive. Man, I miss them hole-in-the-walls, I tell ya! Anyway, the crunch is just amazing to the palate! But I didn’t know exactly how they do it. Until the other day, I saw it on a video and I’m like… hmmm, I can do that! Obviously, you can top it with whatever you want. The simplest way is to stir-fry a dish separately like I did here. Boil the noodles to al dente, 5 minutes, then drain the water. Rinse the noodles in cold water and drain again. Toss with sesame oil to coat. Meanwhile, oil a medium-heated skillet. Spread cooked noodles out to the edges of the pan and press to flatten like a patty. Let it cook, without stirring, until browned on the bottom, about 8 minutes. Flip over to brown the other side. Now, cook your stir-fry the way you want it. 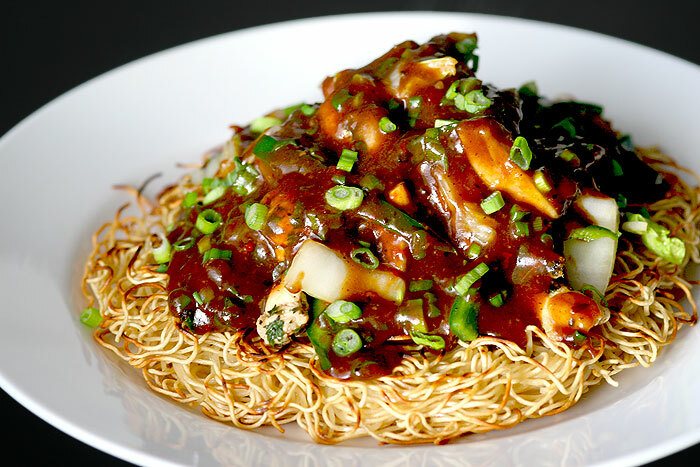 Place pan-fried noodles on a plate and top with stir-fry mixture. Garnish with more scallions and serve immediately (you want to eat it before the noodles get soggy).